Adding or Editing Posts functions much the same as Pages, however there are some additional information you need to enter. 1. You can change the presentation of your posts by setting up Format. 2. You will also need to assign the post to a category which will affect where and when the post appears on the website. 3. On the right hand side underneath the Categories module you can add Tags to your post. Tags are like keywords that visitors may use to search for related articles. For example, adding the tag "wedding" to a catering article and a photography article may help your visitors find related content on your website. 4. There is also an option to add a Featured Image to your post. You can preview and edit posts in the same way as you do for pages. 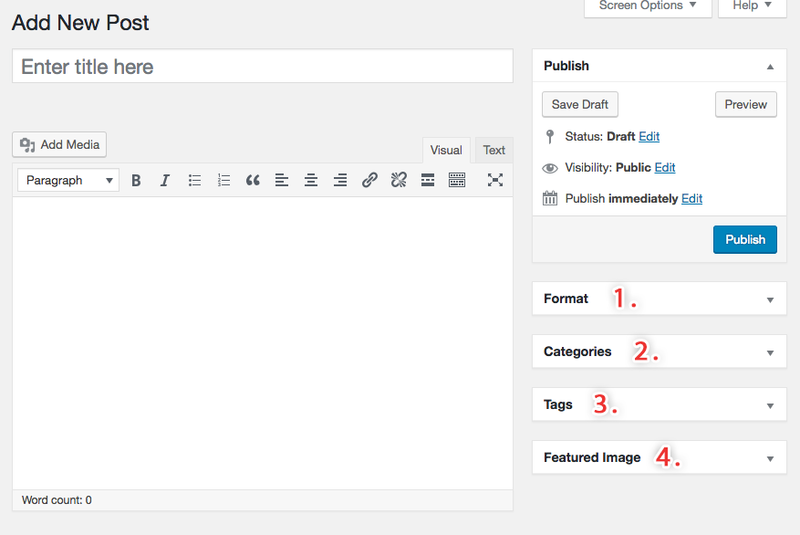 When you want to publish or save your changes click on the Publish or Update button.